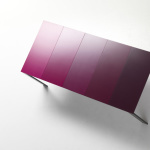 A collection of furniture by Sam Sannia for the Milan Furniture Salone Satellite 2004. 14-19 April, booth I-30 Pavillion 9/2 Milan International Furniture Fair. 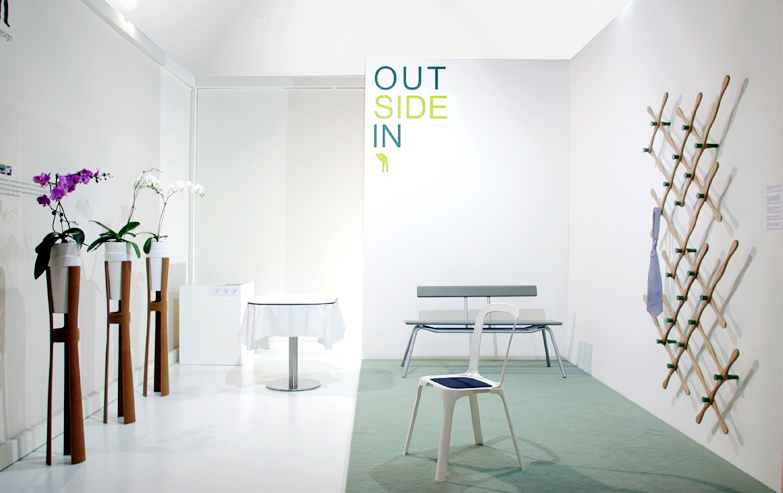 The exhibition OUT SIDE IN is about the difference between what belongs outside and what belongs inside. The concept is to capture the mood of the garden aesthetics, and with it, create a collection of furniture that can be used inside the house. You all know what a geesa is right? Or do you? Well in this case the project is about the material Ghisa, which is similar to cast iron. You will have seen it used for indestructible outside furniture. The concept is to give birth to a modern version of the traditional white flowery chairs usually found in back yards. The chair is assembled with the traditional method: four legs, the seat, and the back rest, and is entirely made of cast Ghisa. The padding is upholstered with water resistant fabric. An aesthetic revisiting of a traditional iron flowerpot stand. An object that belongs indoord, but that needs a touch of the outdoor world. The base is made of three equal parts of plywood and holds a white ceramic vase. When I think of a bench, I think of the classical sitting element with wooden planks which is usually found in silent and peaceful places. This memory for me still remains untouched. What I was questioning in this case was what a modern bench would look like. There is an iconic object which every Italian child remembers: that is the steel clips found on outside bar tables to keep the cloth from flying away. A perfect thing to fiddle with when getting bored of long adult talks….